At Ferran Services, we don’t take the summer heat lightly. We recognize the importance and challenge of keeping a home cool and comfortable year after year. Your air conditioning system serves as both luxury and necessity, answering your expectations for efficiency, capacity, and longevity. As a significant investment, you should never settle for less or live with disappointment. By bringing extensive knowledge and practical experience to every project, Ferran Services offers informed recommendations and perfect solutions. By pairing top-of-the-line equipment with expert workmanship, we ensure peak performance and lasting cooling power. We handle the science, you enjoy the comfort! Everyone recognizes that a good air conditioning system keeps your entire home at a consistent and pleasant temperature. There are, however, many more advantages to a whole-home cooling system. Modern units act as an effective dehumidifier. When relative humidity is kept within an ideal range, you’ll feel cooler at warmer temperatures, allowing higher thermostat settings and lower energy bills. Eliminating that sticky feeling also promotes productivity, reduces fatigue, and promotes better sleep. While excess moisture encourages mold, bacteria, and insects, cool, dry air significantly cuts down on the number of dust mites, allergens, and wards off cockroaches. Have you considered upgrading to variable capacity? Variable-speed technology allows more energy saving potential and improved comfort levels throughout the home. The ability of the system to automatically adjust speeds according to the needs of the home ensures the right amount of comfort control, right when you need it. Outside temperatures rarely, if ever, require your HVAC system to operate at 100% capacity. Variable-speed units determine optimal cooling needs and vary speeds in increments between 40% and 100%. Not only does this tailor comfort, but by running at lower speeds and consuming less power, you’ll save a significant amount on monthly utility expenses. Advancements in equipment design have led to superior filtration. Through sophisticated filtration systems, dust, pollen, dander, particles, and airborne spores are trapped and removed from household breathing air. People who suffer from asthma, allergies, and dust sensitivities will breathe easier and feel better. You’ll enjoy a cleaner, healthier home, and defend against potential illnesses. And by keeping windows closed, you avoid the infiltration of exterior dust, pollen, bugs, and noise pollution. There’s also the added bonus of improved home security. You wouldn’t drive a Lamborghini on a gravel road and expect high performance right? Putting a new high-efficiency AC system in your home without making sure the duct work is intact or that your insulation levels are correct is the same thing. Let a High-Performance Carrier system working at its peak be your sweet ride this summer! When you’re ready to enjoy the long summer in a whole new way, the installation of or upgrade to a modern central air system is facilitated by the team from Ferran Services. As a Carrier Factory Authorized Dealer, we offer our customers products from the recognized leader in the HVAC industry. Since Willis Carrier first invented the modern air conditioner over one hundred years ago, Carrier has continued to set the standard that others strive to follow. Innovations in fan-blade shape, two-stage scroll compressors, and a wide range of ENERGY STAR models ensure amazing cooling capacity for less noise and less cost of operation. Through the Infinity, Performance, and Comfort Series, you’re sure to find the answer to your highest hopes for comfort, efficiency, and price. 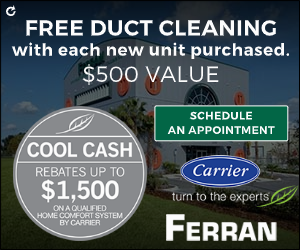 When it comes to installing a new air conditioning system in Orlando, know you can trust in Ferran Services! A+ rated by the Better Business Bureau, Ferran Services continues to uphold a longstanding commitment to customer satisfaction. Our licensed technicians don’t rely on commission but keep your best interest as their top priority. We won’t sell you something that isn’t an ideal solution for your needs and we won’t go ahead without taking a long, careful look at your ductwork and insulation. At Ferran Services we do our homework to make sure your home works at peak efficiency at proper comfort levels. 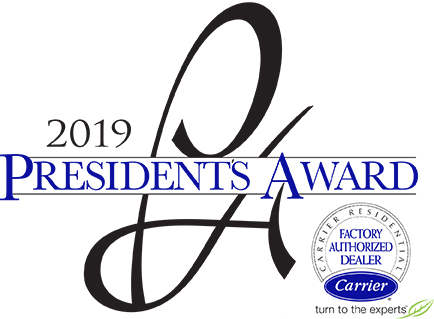 A winner of the Carrier President’s Award, we have been held up as an example of excellence in business, technical expertise, and customer loyalty. We excel in the science of changing out your air conditioner. Contact us at 407-422-3551 (Orlando) or 386-322-6168 (Volusia) for installation throughout Central Florida, and you will always speak to a live, courteous member of our team. The team from Ferran Services does not work on commission. Our main goal is not the sale, but building a long-term relationship that begins with a rewarding installation process and continues through a cost-effective maintenance plan. We deliver the best solution to home comfort across Orlando and Volusia. Contact us and know you will always speak to a knowledgeable and courteous member of our staff. Ferran Services is here to serve your best interests 24/7.